Honor today launched its latest smartphone Honor 10 at an event in London. It comes with Glass body, 6GB RAM, 24MP front Camera. Here's all you need to know about Honor 10. Honor 10 feature a 5.84-inch full HD+ LCD display with a notch on top and 19:9 aspect ratio The smartphone features a display notch, and the software feature also lets you “turn off the notch” with the help of black bars. Powered by Huawei’s Kirin 970 octa-core SoC which comes with a dedicated Neural Processing Unit (NPU), along with advanced AI capabilities (AI 2.0). 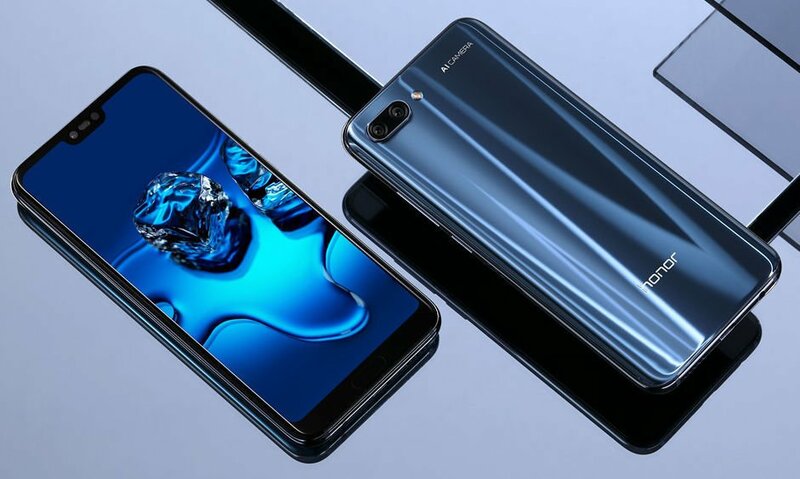 It has a 6GB of RAM and 64GB or 128GB storage, On camera, it has a 16-megapixel primary sensor along with a 24-megapixel secondary sensor and a 24-megapixel sensor for selfies and video calling. It also supports face unlock feature. Honor 10’s dual-camera setup has a lot of AI capabilities. The company is betting big on the device’s AI capabilities, which Honor is calling “AI 2.0.” AI 2.0 can detect dynamic pictures more accurately. The phone’s AI 2.0 can also process Prisma-like image effects twice as fast as the iPhone X. Honor 10 is Packed 3,400mAh battery with fast charging support, the smartphone runs Android 8.1 Oreo update with EMUI 8.1 skin on top. Honor says Honor 10 is Industry's first smartphone with an ever-changing color-changing design. It has an Ultrasonic fingerprint Scanner on the front which can also be used for navigation. Honor 10 comes in Phantom Green, Phantom Blue, Phantom Grey, and Midnight Black color options. €399 for the 64GB storage variant with 6GB RAM and €449 for the 128GB.Honor 10 in Midnight Black and Phantom Blue color to go on sale in India starting midnight today on Flipkart priced at Rs 32,999 for 128GB model. Launch Offers Rs. 5000 off over regular exchange value for all Honor and other select devices, 3000 off over regular exchange value for all other devices valid from 16th May to 18th May. Additionally, there is no cost EMI offer on Bajaj Finserv cards valid on 16th May only, 10% Instant Discount with Axis Bank Credit & Debit Cards which is also applicable to EMI Transactions. And the Jio Offer which includes Rs 1200 cashback + 100 GB Additional data + Benefit of Rs 3300 worth partners voucher.